Choosing the right window fitters in Cumbria is as important as choosing the right windows. At Carnforth Windows, we provide a winning combination of modern products and traditional values. This makes us one of the most sought-after window and door specialists in the region and beyond. We are justifiably proud of our reputation of being one of the North and South Lakes’ longest established window companies. With more than three decades’ experience in the business, we have established strong and enduring ties in the local communities. Along with this, we ensure that our customers have access to the latest and most innovative technology, products and information from across international markets. What sets us apart is our commitment to quality, sensible pricing and our customer-focused approach to every project, no matter how big or small. 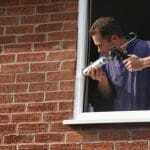 Along with expert fitting of windows, we offer top-quality repairs, replacements and accessories. In Cumbria, window fitters employed by us are highly-trained, licensed, FENSA/CERTASS certified, and experienced. Many people assume that going with one of the big brands is the best thing to do. However, these enterprises are no match for local, independent companies like ours. We offer personalised, customised services, flexible schedules and tailor the project to suit your unique needs, preferences and budget. This being the YouTube and DIY era, it is no doubt tempting to try and install windows and doors yourself. However, this is certainly not a job for amateurs. Only a trained and experienced professional installer can make sure that your windows are fitted correctly. Badly fitted windows can damage the frames and the windows themselves, compromise your safety and lead to waste of energy and heat. While choosing the right window fitters in Cumbria, plan ahead so that you have the time and leisure for the whole project. When you need the services of professional window fitters, contact Carnforth Windows. Though we offer flexible schedules, it’s wiser to plan so that you and your family are not inconvenienced. If you’re replacing old ones, check whether the fitters can remove and dispose of them. Otherwise, you may have to employ another set of people for this.